FOOD, TREATS, FOOD ALLERGIES, ETC. The average lifespan of a Lab right now is 10-12 years. On a grain-free or raw diet, and natural healthcare, the average lifespan increases to 15-19 years! Below are lists of the very best dog foods. Some of the brands you might think are good quality are nothing more than junk food. It’s like feeding your child McDonald’s everyday. They include some pretty high-priced brands that are coasting on old reputations they no longer deserve. What do we feed Covenant Farm Puppies? Taste of the Wild High Prairie Puppy Formula ~Grain-Free with roasted venison and bison. This feed is widely available at Tractor Supply and many other retailers, and on-line. The large franchises like Petco and PetSmart do not carry it, but many pet specialty stores and feed stores do. There is also a Pacific Stream Formula for puppies with smoked salmon. The company has a web site to help you locate dealers in your area. Our puppy customers receive a 3-lb. bag of this food with their puppy when they pick him up. We receive no compensation from the manufacturers. 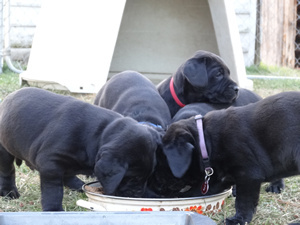 We have no preference in terms of grain-free foods, but this food is widely available and reasonably-priced, and our puppies like it universally, and it has given them a great start.